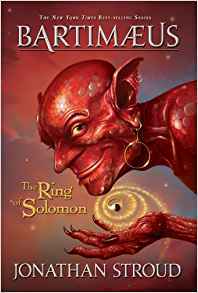 The Ring of Solomon by Jonathan Stroud. When I had found that Jonathan Stroud had written another book using the conceited djinni with a very off beat sense of humor I immediately sent for the book, because I had so loved his trilogy where I first met Bartimaeus and found myself laughing out loud at a demon! Could Stroud really capture the essence of Bartimaeus once again? Could he find the same insulting humor in the djinni as he once had? I feared I'd be disappointed so I read a few other books before I finally picked up The Ring of Solomon. I didn't have to read too long before I knew without a doubt that Bartimaeus was back in all his glory! I smiled and chuckled and even laughed at times while reading this book... Jonathan Stroud had done it again! He had successfully given me yet another fun book to read! I will keep it with the trilogy and read it again one day. If you read the first trilogy let me put your mind to rest and tell you that I promise you will like this book too! No, it does not take place in England as the trilogy did. But that doesn't matter. What does matter is Bartimaeus has returned once again, and if Jonathan Stroud is smart (and I think he is) ..he won't "release" Bartimaeus, but keep him as his slave for more books to come! Any book he writes that has Bartimaeus in it, is a book I will buy, devour and totally enjoy! Thanks Mr. Stroud ! I hope I haven't seen the last of that particular djinni !! 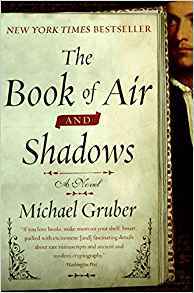 The Book of Air and Shadows by Michael Gruber. Starred Review. In this ingenious literary thriller from Gruber (The Witch's Boy), the lives of two men are changed forever by William Shakespeare and the letters of Richard Bracegirdle, a 16th-century English spy and soldier. Jake Mishkin, a Manhattan intellectual property attorney and a bit of a rake, goes on the run from Russian gangsters. Albert Crosetti, an aspiring filmmaker working for an antiquarian bookstore, finds that life is more exciting than movies—perhaps too exciting. Together, Mishkin and Crosetti travel to England in search of a previously unknown Shakespeare manuscript mentioned by Bracegirdle. Though the pace sometimes slows to allow Mishkin, Crosetti and Bracegirdle to divulge interesting aspects of their personal lives, these digressions only make the story more engaging. The suspense created around the double-crosses and triple-crosses works because of the close connection readers forge with Crosetti in particular. The mysterious murder of a Shakespearean scholar, shootouts in the streets of Queens and an unlikely romance all combine to make for a gripping, satisfying read. I was beginning to wonder if I would ever finish this book! As you can read, the review above made this book sound pretty good and when I found it on sale for like about 5 dollars I figured I'd give it a shot. Most of the book confused the heck out of me.. too many people to keep straight, sometimes using first names and other times last names, that doubled the problem for me. And I will say I liked the idea of this story even if it isn't a new one and as many mysteries do, the last 1/4 of the book came alive with action and I was pleased with the ending. My reading is about as fast a molasses flowing in winter! I can't believe this is only my second book in January! Needless to say I won't be posting a "what I read in January" post! Funke takes readers on a new adventure into a magical place where the dark side of fairy tales holds sway. 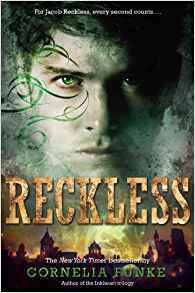 Jacob Reckless, like his father before him, escapes into the Mirrorworld, and all is well until his younger brother, Will, follows him in and falls under the enchantment of the Dark Fairy. Through an injury, she turns him slowly into a Goyl, a person made of stone. Jacob is determined to rescue his brother and restore him to himself. Accompanied by his companion, a shape-shifter girl/vixen named Fox, and Will's girlfriend, Clara, Jacob journeys with Will to find the antidote to the spell. With a large cast, including a dwarf, powerful fairies born from water, deadly moths, man-eating sirens, unicorns, and the terrifying Tailor with fingers ending in blades and needles, the story includes multiple fairy-tale motifs as the characters grapple with fear and despair while on their seemingly hopeless quest. The action picks up midway through the book and races to an exciting climax. 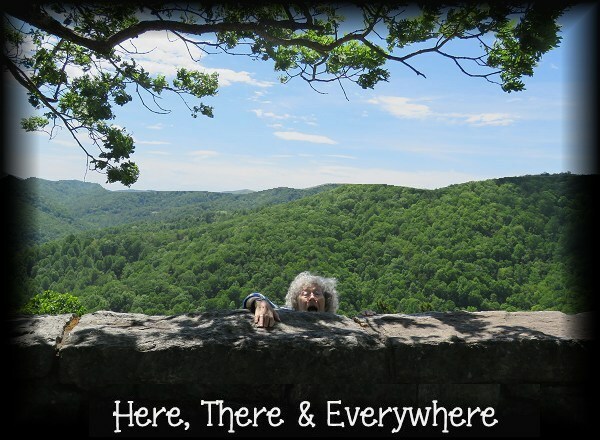 Despite some loose plotting and broadly drawn characters, readers are pulled into the thrill of the story. The themes of guilt, responsibility, abandonment, and love, in the context of the many dangers in the Mirrorworld, contribute to a serious tone. Ultimately the characters keep faith with what matters most to each of them. Cornelia Funke has to go down as one of the best story tellers there are. She is fantastic. This book is a young persons book but she still has ways of making her story interesting to even old folks like me. What I found a nice touch was that every so often a "fairy tale" is mentioned, such as Snow White and Rapunzel, I thought it was quite clever how she did it. I am sorry I took so long to finish reading this book.. I was being torn between the book and crocheting (still crocheting ) and even television, which i generally share with reading and it's not a problem. In all honest here I have to say that this read for a younger person quite a bit more then Inkheart did. So if you liked Inkheart and you think you might like this book.. well.. you might but I don't think it's up to Inkheart standards. But I'm still glad I read it. I'm glad to remember what a really excellent story teller Cornelia Funke is.